Fort St. George in Chennai has a small but impressive museum that houses artifacts from Chennai’s colonial period. The museum has artifacts in a range of categories including: arms, coins, porcelain, oil paintings, medals, and textiles. While photography is prohibited inside, there are a number of cannons outside–including some ornamental ones. Orwell’s novel is about the ugly face of empire. It takes place in a Burma that was administered by the British as part of their Indian colony—but it’s in the waning days of the Empire, much to the chagrin of the entitled and chauvinistic European characters of the book. Most of the characters are shockingly racist and life abroad hasn’t broadened their thinking in any discernible way. The notable exception is the lead character, John Flory, whose best friend is Dr. Veraswami (an Indian medical doctor and government official) and who is unique among the British for being able to see the native ways as anything other than primitive and preposterous. However, the hero is deeply flawed. Flory is a coward, and in the early pages of the novel is unwilling to support the nomination of his good friend Dr. Veraswami for membership to the expat’s club because many of its more vociferous members will be damned before they admit a brown person. Flory is also a bit morally loose for the taste of his early post-Victorian comrades. He has a birthmark that he’s constantly trying to conceal, and whose presence we are led to believe is crucial to his lack of confidence. While the main intrigue is provided by a plot by an unsavory Burmese official named U Po Kyin to undermine Dr. Veraswami and bolster his own stock among the whites, it’s Flory’s story that we are following. The reader hopes that Flory will develop the confidence needed to rise to the occasion—he being the only likable person in the cast (except perhaps Dr. Veraswami, depending upon how put off one is by the Indian doctor’s borderline Uncle Tom-ish obsequiousness.) Flory’s relationship with a young woman plays an important role in his story and sometimes it seems she may spur him to heights while at other times she looks to be his downfall. Flory’s conundrum is that the more virtuously he behaves, the more a target is painted on his back. While the book is set almost a century ago, I found that it has something to say today. While the times have changed and the Empire is long dead, there are times that the long shadow of this period can still be seen in the current era. I’d recommend this book for readers of historical fiction and particularly those interested in the past and present of areas under colonial rule. Orwell builds interesting (if often despicable) characters and the book has a well-developed and interesting narrative arc. Taken October 16, 2013 in Delhi. 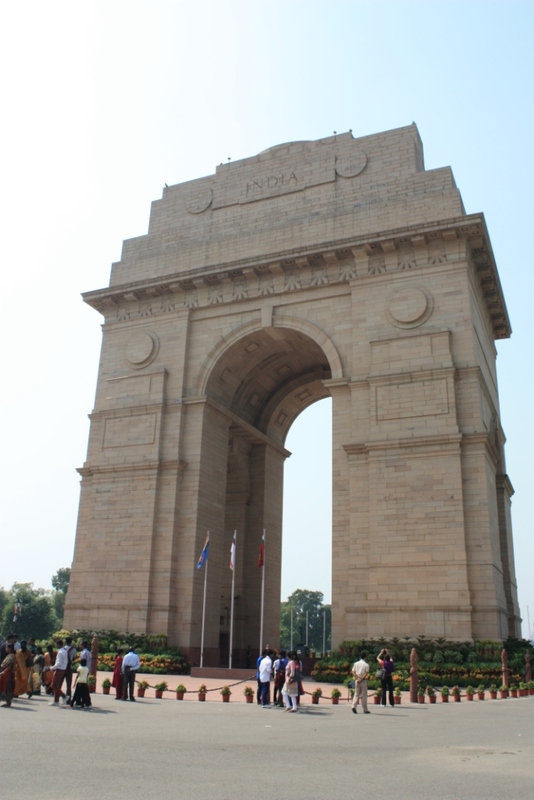 The India Gate honors 70,000 Indians who died during World War I fighting on behalf of the United Kingdom. Beneath the arch is India’s Tomb of the Unknown Soldier. It’s India’s answer to the Arc de Triomphe, and it sits at the opposite end of the Rajpath from the President’s house, i.e. the Rashtrapati Bhavan. Like the President’s house, the Gate was designed by Edwin Lutyens, a famous British architect. The India Gate is among the must-see sights for visitors to New Delhi.